This section presents my development of the Interdisciplinary, Inquiry-based Learning (IDIBL) Framework as strategic mechanism to bring about cross-institutional adoption of the model of Work Focussed Learning. It also makes a cybernetic analysis of the pedagogy of the model of Work Focussed Learning in delivering a personalised curriculum. In collaboration with colleagues and with support from the senior managers, I established the Interdisciplinary Inquiry-based Learning (IDIBL) project as a strategic, cross-university intervention based on the learning and experience of the Ultraversity project. From the university perspective, the project was established in response to the analysis that learning in the workplace would increasingly provide an important market of students and online supported, inquiry-based learning would enable this. Personally, my motivation was to continue the work of the Ultraversity project; to widen participation for groups of learners who cannot take advantage of current university taught provision. For the purpose of this claim, my role in this project was as a developer and implementer of the IDIBL Framework, which was one of the main actions of the IDIBL project. In constructing this section of my claim, I have analysed and reflected upon my working practices around the IDIBL project in terms of the characteristics of the IDIBL Framework that make it an innovative curriculum design. Table 4 highlights the significant aspects of my practice and links this to my portfolio of evidence. In this section, I will introduce the IDIBL project including its aims and objectives, and then describe the IDIBL Framework. I explain the pedagogical approach followed by an evaluation of the effectiveness of the framework based on interviews with staff involved in its development and use. I offer a cybernetic viewpoint and us it to analyse the framework’s pedagogical and organisational characteristics. In conclusion, I identify my contribution to knowledge and argue that the characteristics of the IDIBL Framework make it a useful tool for bringing about institution-wide curriculum change. The IDIBL project at the University of Bolton (UoB) used an action research approach, the aim of which was to, “stimulate development across Bolton University of successful models of e-learning and inquiry-based learning where appropriate.” [P18 p6]. A key mechanism for achieving this was the development of the IDIBL Framework, “for awarding qualifications at the University of Bolton which permits negotiation of learning and negotiation of award within a quality framework” [P18 p6]. Included in the project plan were the assumptions that the work was part of the development plan for the university, because of this senior management and key departments such as marketing and admissions would be supportive, and that the existing quality assurance and validation mechanisms were ready to take part in this innovation [P18 p2]. The IDIBL Framework was designed to work within the current systems and processes, but also to encourage systemic change across academic and service departments working practices. As such, the IDIBL project invited participants from all academic departments of the university to implement courses of their own. To achieve this, it was my belief that the framework should be designed in such a way that it could be, “readily adapted by departments to their own subject disciplines and professional contexts of potential students.” [P18 p3], as the work required for the validation of new courses can be a significant barrier to innovation. The framework is based on the model of Work Focussed Learning, explained in Section 3.3, and describes a personalised experience for learners supported through an online community of inquiry, using inquiry as a learning strategy and patchwork media for assessment. Reflecting on this now, and with the insight generated through the concept of variety, it is apparent that the model of Work Focussed Learning and the development of the reusable framework are attempts to address problems of managing complexity (variety) found in higher education systems, and this is explained in Section 4.6. The IDIBL Framework consists of a curriculum described by overarching learning outcomes, more detailed modules and a pedagogic approach to learning and teaching that are closely linked in their design. 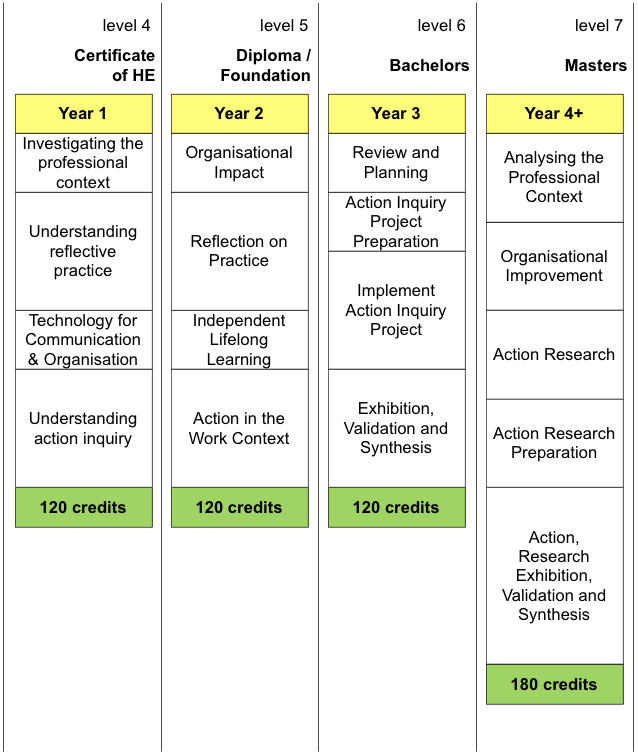 The curriculum was defined by set of linked module definitions at HE levels 4-7 and a pedagogic approach describing teaching practices, learning and assessment. Designed to be highly personalised, the framework allows students in different work contexts to structure action-inquiries that they identify as a part of their daily work. they seek the advantage offered by technology to enjoy the possibility of work on joint ventures and studying collaboratively.” [P25 p3]. From this perspective, students are active creators of knowledge. Learning is a social act, which consists of a dialogical relationship between the teacher and student. The educational experience is negotiated, and the curriculum ‘emerges from the systematic reflection of those engaged in the pedagogical act’ (ibid., 281). The importance of identifying this stance is not only in stating the values and beliefs that are behind such a curriculum, but also in recognising that for many, it is a view of curriculum that will be unfamiliar and challenging. In terms of the focus of the curriculum and the roles and responsibilities of teachers and students, there was always likely to be an uphill struggle to persuade fellow teachers of the framework’s value if their interest in curriculum is different. The module components of the IDIBL Framework, see Figure 7, offer a coherent set of modules through levels 4 to 7. A key feature is that there are no choices or options, the course is designed to offer progression between modules and levels and students can find choice through their individual learning plan, negotiated as an inquiry proposal for each module. A coherent set of behavioural and knowledge objectives are written for each level of the framework, Table 4, Framework Learning Objectives. This is designed to give a coherent experience to the student and ensure progression through the overall model of Work Focussed Learning and to focus on the key behaviours that the model of Work Focussed Learning is trying to achieve. At the same time, the objectives require students to demonstrate recognisable attributes expected of discipline or subject-focussed graduates. Table 5 is an extract from a module definition that illustrates the general syntax of the learning outcome (LO) and assessment criteria (AC) used across all of the modules. In the era of mass-produced higher education, the LO has become adopted as the basic, assessable building block for the description of the curriculum (QAA 2007, 13) in that it describes the intention of what a learner will know and be able to do on successful completion of a programme of learning. When writing LO and AC, great care was taken to construct them in such a way as to be non prescriptive about a person’s work context but instead describe future academic and professional capabilities they should develop as a result of undertaking the module. There was also an attempt to adhere to established practice of writing LO (Moon 2002). The associated AC describe how the behavioural requirement of the LO will be evidenced and both elements are designed to reinforce the inquiry-oriented pedagogic approach rather than specific reference to disciplinary knowledge or skills. The curriculum design requires a student to undertake an inquiry in their workplace, related to a professional context or discipline. The use of learning outcomes is an appealing approach for management and quality as it makes uniform the way in which curriculum are described offering the prospect of a common student experience and a way of standardising evaluative judgements about achievement. However, from the teaching practitioners’ standpoint the approach can be quite problematic. It over-simplifies what are complex attributes of a higher education that is difficult to describe and in doing so, falsely claims to objectify the process of assessment (Hussey and Smith 2002). For the model of Work Focussed Learning the outcomes based approach allowing for a high degree of interpretation by learners and assessors is an appropriate means by which to personalise the curriculum to the specific work context. In the academic proposal and student handbook, places where identified where programme specific additions and amendments would be required when seeking specific course approval. It was anticipated that use of the IDIBL Framework to validate future courses would be based on the minor modification regulations. This would offer a less onerous route to validate a course, as there are fewer requirements. With this approach, a standing panel of a board of studies approves the amendments, without the need for establishing a full panel that includes external examiners and representatives from other parts of the university. Full validations are identified by staff developing courses as a barrier to course development because of the amount of work required [P22 p29-30]. Over 5 years, staff have used the IDIBL Framework to develop their own programmes and have recruited and taught students successfully, including the ‘Masters in Learning with Technology’ [P29] which I led. This Masters was validated as a proof of the concept of both the IDIBL curriculum design and the agile validation of new courses based on this approach. It was envisaged that subsequent users of the framework would be able to use this experience to give the university confidence in allowing new programmes to require minor modifications of the framework. Another instance of the Frameworks use was for a suite of programmes around Regeneration and Sustainable Communities were developed at undergraduate and postgraduate levels [P34 p4]. In addition, through the evaluation activities of the IDIBL project, I found that the ideas and approaches introduced by the framework have been adopted and adapted by colleagues for their own purposes that I had not anticipated. The key pedagogical elements of the framework are the mechanisms for student support, personalisation of the curriculum, and the approach to assessment. These are briefly described below. students taking responsibility to develop their own peer-to-peer support networks. One of the key strengths that students report through this approach is the support and encouragement they can offer each other to continue with their studies [P21 p74-76]. The ideas above are central to the framework developed. In operationalising the approach there are challenges in ensuring that it is viable in terms of the resources required to offer a good learner experience, but not seen as inefficient and expensive from the institutional perspective. The experience of the Ultraversity Project indicates that as student numbers increased, a new balance was found between the staff activities of content delivery, facilitation and marking, such that the approach was economically viable for the institution. shell modules where negotiation about the learning outcomes is undertaken on a one-to-one basis and where the learning outcomes themselves can be negotiated. The Work-focussed Model used in the framework aims to achieve is personalisation and choice for the students about their inquiry, but at the same time ensuring that they follow the curriculum and pedagogy designed with the intention of them taking actions for improvement in the workplace. IDIBL takes its approach to assessment from the model of Work Focussed Learning, and uses assessment through patchwork media, a development of Patchwork Text (Winter 2003), which is an approach to assessment born out of frustration with perceived limitations of the essay in higher education. This is described in 3.5.1.1 Activity Design. The intention is to provide a means for assessment that utilises the authentic workplace knowledge and workplace activities students bring, rather than seeking to slavishly follow the rules of ‘academic literacy’ (ibid., 118-120), and thereby ‘warping’ the learning experience. It cannot be overemphasised how important these principles are to the model of Work Focussed Learning. The IDIBL Framework was evaluated using a constructivist grounded approach. Data was gathered from eight in-depth, semi-structured interviews of key stakeholders who were selected for their participation in the project. In all cases interviews were recorded and transcribed, and then coded to identify key issues: the qualities of the IDIBL Framework itself; and the nature of the intervention made in the university. This was supplemented with project documents produced for the validation process, and an evaluation of activities by the project team (Millwood et al., 2010) working with academic and administrative staff and employers using email and other evidence from personal communications. Through the evaluation, I was seeking to understand how the IDIBL Framework worked, “The idea is not just to discover whether a programme works, but to explain how it works” (Clarke 1999, 4). With this approach, there is explicit aim to generate findings that are of value beyond the programme or project being evaluated; the evaluation’s purpose is not just to help the decision makers of the programme or project under study. Further, my aim was to identify the underlying mechanisms that are at work, in an inquiry informed by Realistic Evaluation, “it is not actual programmes which work but the reasoning and opportunities of the people experiencing the programmes which make them work” (Tilley and Clarke 2006, 522). This meant extracting stakeholder views, theories, distinctions and experiences of the IDIBL Framework. This approach was intended to help identify an original contribution of the framework to curriculum design. The original theoretical proposition put forward by the IDIBL project was that, “The framework describes an approach to teaching, learning, and assessment including generic modules will enable staff across the university to readily develop new courses along particular themes without the need to undertake a full-validation event or author new modules” (Millwood et al. 2010, 2). The evaluation activities were designed to elicit stakeholders’ judgements about the validity of this statement and the ways in which they themselves see the university responding to curriculum initiatives. This insight is important in action research as it ensures evidence is gained to inform further cycles of action research. Lastly, in the context of my work in the Institute for Educational Cybernetics (IEC), I had been heavily influenced by systems thinking and in particular Cybernetics and the Viable Systems Model (VSM) as an analytical tool, which I decided to apply to help explain the IDIBL Framework approach. As stated earlier, it was envisaged that a characteristic of the IDIBL Framework was that it would be readily re-used to develop new courses without the requirement for a full validation process. This is a challenge to existing validation practice and regulations and met only with partial success. Although the framework was validated and approved, two subsequent course validations, based on the framework, were required to go through the full validation process, which defeated one of the project’s aims. With hindsight and a greater experience of quality mechanisms, processes and working practices in the university, I think it likely that this was because, although validated as a framework, the idea of reusing such an approach was not fully enculturated in the university nor explicitly promoted by the Quality Assurance and Enhancement Unit. Marketing particular programmes fell into two parts. Firstly, an invitation to employers (including professional associations and development agencies) to take part in creating a bespoke course using the framework and secondly to recruit students to the Masters degree in Learning with Technology and Undergraduate and Masters in Regeneration and Sustainable Communities. “the course features in our bid documentation for (a Local Education Authority) as an example of how we might develop Continuing Professional Development capacity.” (educational service provider). Others were concerned that the framework should include direct content delivery – fully negotiated learning was a step too far, and the action research progression was not fully understood. Where a trusted relationship with an employer already existed, proper engagement did take place, although not on the scale hoped for. Whether the enthusiasm or trust existed or not, little significant development came from these contacts. For recruitment, the marketing department of the university was similarly enthused by the framework, but whilst offering good advice and support for developing leaflets, the courses and approach did not figure strongly in the marketing activity of the university. The project team felt that the push needed would have taken a more significant involvement from the marketing department which was already heavily committed selling the existing university offer. Most of those who enrolled were by word of mouth and personal contact. From first hand experience of this and the Ultraversity work, I know that materials created for marketing don’t effectively communicate the approach to many people. Challenges include the apparent lack of content, the strangeness of its central concept and the absence of a clear statement of what would be learnt. This is a fundamental challenge faced when trying to introduce a new product that is very different from the well-recognised models of higher education. I am certain that there is no simple solution, but know from experience that if enough effort is put into marketing and promotion then there are significant groups of learners who can relate their own circumstances to the offer being made and will chose to purchase it. This point is returned to in the concluding chapter from the perspective of disruptive innovations. As indicated in Section 2.1, the use of Cybernetic concepts to explain my practice was introduced to me when I joined the Institute for Educational Cybernetics, and in particular the Viable Systems Model (VSM) developed by Stafford Beer, expanded on below. In particular, the connection between Cybernetics and Action Research made particularly evident by Soft Systems Methodology (Checkland and Poulter 2006), arguably a form of action research, enabled me to make a clear connection with my previous work. The use of Cybernetics theory to explain the workings of HE institutions is not widely exploited although Birnbaum (1991, 177-200) does provide a holistic analysis and practical explanation of the organisation of the university from a Cybernetic viewpoint. In addition, Britain, et al., (2007) offers an explanation of the application of the VSM to e-learning in HE that usefully covers the main features of the VSM (Beer 1985). This provided the starting point for analysis, conducted in retrospect in order to reflect on and analyse the IDIBL Framework. Cybernetic explanations are based on a systems analytical approach and can be applied at the micro and macro levels, to mechanical, biological and social systems. They are concerned with feedback loops between a system and its environment rather than being concerned with identifying the purpose of every constituent part. This avoids the necessity to understand every detailed causal relationship, which might lead to an over elaborate model which was ineffective as a predictor of real world activity. In turn, this means accepting that we may remain ignorant of the features of the processes within a sub-system and see these as a ‘black box’ (Jackson 2003, 86-87). A key concept in Cybernetic theory is that of ‘The Law of Requisite Variety’, developed by Ross Ashby and interpreted for use in understanding the management of organisations by Beer in his VSM as “only variety can absorb variety” (Beer 1985, 26), where ‘variety’ is defined as “the number of states of which a system is capable of attaining.” (Britain, et al., 2007, 11). The term variety is used to describe the complexity that management needs to deal with and is used for comparative purposes rather than being something that is precisely measured (Beer, 1985, 22). It is the case that the management variety will always be less than the variety of the operations it manages. Maintaining an effective balance between the different variety exhibited by management and operations is a central theme of the VSM and is achieved through amplifiers and attenuators as mechanisms for control, constituting a feedback loop. An amplifier increases the variety of responses by management on the operations of an organisation and the environment it is operating in, whilst an attenuator reduces variety of responses experienced by the operations from the environment and the manager from the operations. 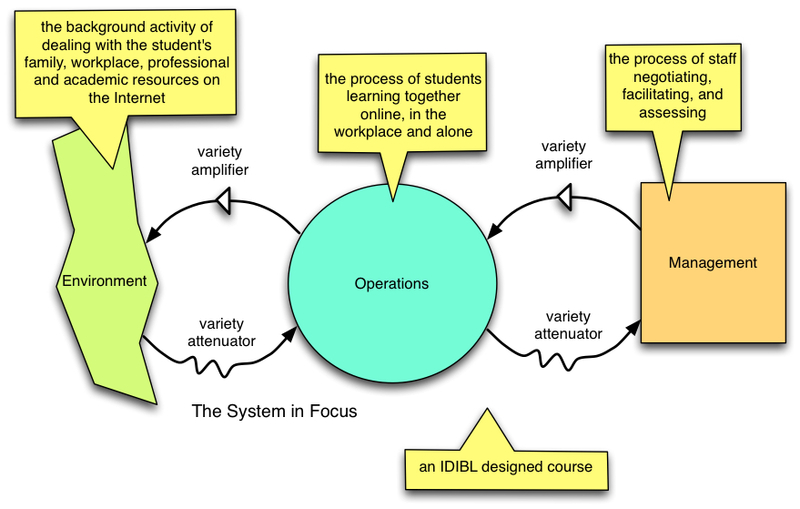 In Figure 8, the IDIBL Framework is subjected to a partial VSM analysis, as shown by the classic cybernetic diagram, with the ‘system in focus’ being the teaching context where interactions are between staff and students. My practice was in the role of management, operations was the work of staff to deliver courses and the environment included the students and their needs. This law has proved invaluable in my reflection and analysis of not just the IDIBL Framework and online learning, but actually all of my teaching work over the past 20 years. A key principle identified by Beer was that the steps taken to absorb variety in an institutional system should be, “designed to do so with minimal damage to people and to cost” (Beer 1985, 35). Choices made will have intended and unintended consequences that will determine the success or otherwise of the organisation, impacting on factors such as human happiness, creativity, efficiency, productivity, innovation, the capability and the capacity of an organisation to adapt to changing environments, etc. (Britain, et al., 2007, 11; Jackson 2003, 100). In addition, a VSM analysis anticipates that there needs to be opportunities for adaptation and self-organisation within sub-systems of the whole, “parts must be granted autonomy so that they can absorb some of the massive environmental variety that would otherwise overwhelm the higher management levels” (Jackson 2003, 107). Getting an appropriate balance between the different feedback and control mechanisms is a key challenge of the designer of a system. In the case of IDIBL, the challenge is one of learners and their organisational context and university teachers mediated through technology. time spent producing assessment products separate from authentic work tasks. challenging moderating issues of comparability. In turn, this diverts staff effort away from other teaching tasks. Another example is the personalisation of the curriculum in IDIBL. The challenge is to amplify variety in ‘management’ to match ‘operations’, as seen by students in the states presented by staff. One solution is to offer a wide selection of modules, each with a particular narrow curriculum focus that students can select from. The IDIBL Framework chooses a different solution – a fixed number of compulsory modules but with learning outcomes written in such a way that they can be used in a wide variety of work contexts. I argue that this amplification matches these particular students’ needs better. This is a simplification for the quality arrangements in the university, although it is problematic in that it challenges established norms and ways of doing things. In both established HE approaches and IDIBL, of these cases the choices made have costs for each part of the system, and this raises a question; which choice overall produces the ‘best’ results, does the ‘least’ damage and maintains a viable solution? Table 6, Analysis of Requisite Variety uses a cybernetic viewpoint to explain how the implementation of the model components can meet the variety challenges of the feedback loop between operations (students) and management (staff). In particular, addressing the needs outlined above; time and place, the affordance offered by technology to vary the parameters under which we organise learning to that we can offer personalisation and choice – that is what, when and how students study. We also identify organisation of teaching, not explicitly addressed by the model, as worthy of significant attention. As well as identifying attenuators and amplifiers in the system, I also identify where self-organisation, that is students coordinating themselves in support of each other, is an important aspect of the design. This self-organisation could be analysed as a sub system – a ‘recursion’ of the analysis (Beer 1985, 2-6) – but the system focus for this section is at the level of the course as a whole. The discussion about the struggle to innovate, persuade and sustain the IDIBL approach in traditional UK higher education is beyond this cybernetic analysis. This is addressed in Section 5, Collaborative Curriculum Change. The findings from interviews confirm that peers attach value to the development of the IDIBL Framework with staff finding it a source of inspiration and as a useful tool for critique of their current practices. However, for some staff, established practice and preconceptions render the approach described by the framework irrelevant, as there was a significant dissonance between it and their own beliefs about what a university degree is, and how it should be delivered and studied for. This raises questions about what might be required when seeking to develop step-changes in types of provision and whether such innovations can be embedded university-wide. In this cycle of my action research, raising the level of critical debate around curriculum design amongst colleagues was more successful than recruitment of students to new courses – the original main intent. It was also apparent that in proposing the IDIBL Framework, a particular aspect that required further attention was to understand how to market novel curriculum approaches to potential students, employers and other stakeholder groups. Encouragingly, the action research undertaken shows that the university has the capability to develop atypical curriculum designs and that quality assurance mechanisms are flexible enough to respond positively to the demands placed upon them. Although the IDIBL Framework proved useful to curriculum designers, this was not always in the way anticipated when it was created. Some staff found the model valuable as a thinking tool to systematically critique current practices, exposing rigidity and assumptions behind curriculum design in the university’s existing practice. The model had a particular view of how new courses could be created which worked best when staff had already identified the problem of relevance to the students’ employment and were in ill-defined subjects that were newly emerging or fast changing. For these staff the model was a valuable source of inspiration and of practical help in validating their own courses. However, the approach does not fit well with the practice of academics developing new courses in a piecemeal way, either around an area of specific interest to them or by re-working existing modules and courses. For colleagues who have a very different view of what a curriculum is and what it is to study at higher education, the IDIBL Framework lacks relevance. Although validated as a model by the university, this did not accord it with the status of a regulation or even guideline. If the model is to be established in the ‘fabric’ of the institution and to be more than an experiment to develop inquiry-based forms of learning, then more effort would be required to ensure the model was ‘officially’ adopted in its regulations. This highlights a gap between the university’s strategy and implementation. The model omitted to explicitly address some of the organisational changes required. For example, the notions of team teaching, online community of inquiry for teaching staff and new productivity and management arrangements, which were present in the earlier example of the approach developed by the Ultraversity project, were not addressed. The Cybernetic analysis is useful too, for course designers, in particular the notion of ‘absorption’ of variety, when considering the impact of choices they make on students and teachers. This involves seeking to minimise the negative impact on both groups and making better use of internal, self-organising, mechanisms for absorbing variety as well as attenuators and amplifiers. This suggests the following cybernetic analysis in Table 7, proposal to match variety issues related to teaching. Teaching How to avoid the inefficiency of asynchronous and geographically separate activity by following the expectations of the ‘standard’ productivity arrangement in UK HE Opportunity to access advice from all members of the staff team.Questions from individual students answered publiclyClarity about the expectations of responsiveness from staff. Creation of frequently asked questions.Code of conduct for online behaviour reduced personal response, emphasis on self-organisation through online community of inquiry. Self-organisation & team teaching allows for new, flexible working practices such as sharing the responsibility to respond to students & modelling desired behaviours through discourse between staff. For cross-institutional initiatives that seek to promote a particular pedagogical approach, it is vital that at an institutional level that there is clarity about what is trying to be achieved. If the purpose is to better understand an organisation and stimulate new ideas and thoughts widely, the model approach is worth replicating. If however, the immediate imperative is to recruit significant numbers of students, then such activities probably need to be located in a dedicated unit. This is because, in cybernetic thinking, the issue of purpose is critical to the effective running of an organisation. With no agreement about this, the managers and workforce will be in conflict with parts likely to fail. Hoverstadt (2008, p 256) points out that the easiest way to respond to this challenge is to have a plurality of purposes although this is often not made clear and in itself results in conflicts between different purposes, “The key to transparency is structural, with different sets of activities or organizational units tasked with handling the different agendas”. This simpler environment insulates the innovation from the conservative effect of the existing university organisational design. This point will be returned to in the conclusion including the application of the theory of Disruptive Innovation. Finally, I have not explored fully the problems of explaining the approach to potential students and employers, whose preconceptions of what it is to study in higher education were found not to match the IDIBL Framework as we communicated it, despite the learner-centred motivation in its design. This is a challenging problem that the success or failure of the approach ultimately rests upon and will be explored further in section 5 of my thesis. identifying some of the key challenges of pedagogic innovation in a university. The challenge of introducing and socialising the IDIBL Framework led to the development of the Coeducate project with the direct aim to understand curriculum development, identify barriers and propose & develop solutions to make the development of new and innovative programmes easier.